• Of all creatures great and small, a little amphibian, the salamander, is the one with the greatest collective biomass in all of WNC. • There are an estimated 500 species of salamanders. This one is known for being a bit stocky and very secretive, preferring to hide out underneath logs as much as possible. • The color bands on female marbled salamanders are mostly gray, with the males sporting a whiter stripe. • Most marbled salamanders that die a natural death do so around ages eight to 10. • Unlike many salamanders, marbled salamanders aren’t poisonous. 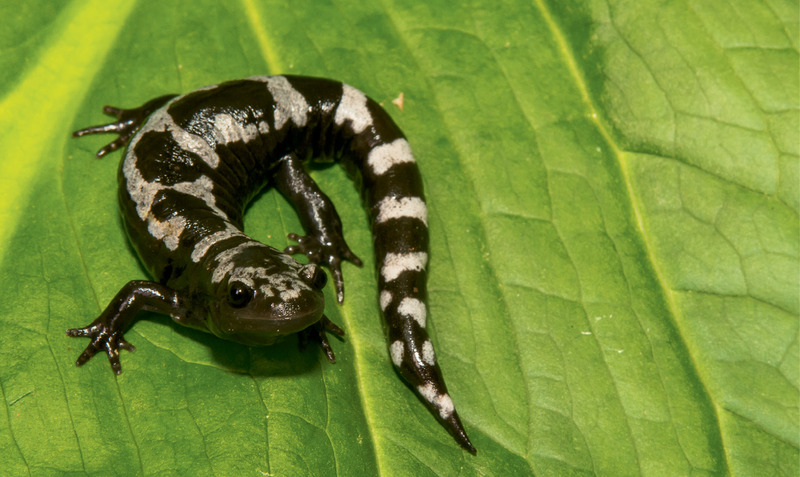 • Grandfather Mountain will host a Salamanders of Grandfather field course Saturday, June 24, from 10 a.m.-5 p.m. The course is free with regular admission; visit grandfather.com for details.